Our team from Faith United Methodist Church recently participated in the Liver Life Walk in Cleveland. The team, "Speed's Walkers," honoring Faith Pastor Dave Sperry, whose nickname is “Speed,” raised more than $1,700 for the American Liver Foundation. 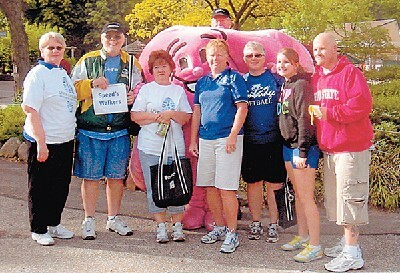 The entire walk raised more than $80,000. In the picture at the Liver Life Walk in Cleveland are, l to r, Marilyn White, Pastor Dave Sperry, Connie Minder, Donna Gotschall, Diana McMahon, Sarah Gotschall, Ed Warne; hiding behind "ALFie the Liver," is John White.